What is the cheapest way to get from Cesenatico to Ravenna? The cheapest way to get from Cesenatico to Ravenna is to bus which costs 3€ - 5€ and takes 44m. What is the fastest way to get from Cesenatico to Ravenna? The quickest way to get from Cesenatico to Ravenna is to train which costs 2€ - 6€ and takes 25m. Is there a direct bus between Cesenatico and Ravenna? Yes, there is a direct bus departing from Cesenatico and arriving at Ravenna. Services depart once daily, and operate every day. The journey takes approximately 44m. Is there a direct train between Cesenatico and Ravenna? Yes, there is a direct train departing from Cesenatico and arriving at Ravenna. Services depart hourly, and operate every day. The journey takes approximately 25m. How far is it from Cesenatico to Ravenna? The distance between Cesenatico and Ravenna is 28 km. The road distance is 30.6 km. How do I travel from Cesenatico to Ravenna without a car? The best way to get from Cesenatico to Ravenna without a car is to train which takes 25m and costs 2€ - 6€. How long does it take to get from Cesenatico to Ravenna? 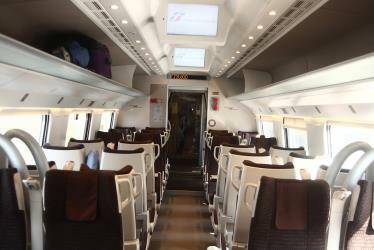 The train from Cesenatico to Ravenna takes 25m including transfers and departs hourly. Where do I catch the Cesenatico to Ravenna bus from? Cesenatico to Ravenna bus services, operated by Autoservizi Comazzi srl, depart from Cesenatico station. Where do I catch the Cesenatico to Ravenna train from? Cesenatico to Ravenna train services, operated by Trenitalia, depart from Cesenatico station. Train or bus from Cesenatico to Ravenna? The best way to get from Cesenatico to Ravenna is to train which takes 25m and costs 2€ - 6€. Alternatively, you can bus, which costs 3€ - 5€ and takes 44m. What companies run services between Cesenatico, Italy and Ravenna, Italy? Trenitalia operates a train from Cesenatico to Ravenna hourly. Tickets cost 2€ - 6€ and the journey takes 25m. Alternatively, Autoservizi Comazzi srl operates a bus from Cesenatico to Ravenna once daily. Tickets cost 3€ - 5€ and the journey takes 44m. Where does the Cesenatico to Ravenna bus arrive? Cesenatico to Ravenna bus services, operated by Autoservizi Comazzi srl, arrive at Ravenna station. Where does the Cesenatico to Ravenna train arrive? Cesenatico to Ravenna train services, operated by Trenitalia, arrive at Ravenna station. Can I drive from Cesenatico to Ravenna? Yes, the driving distance between Cesenatico to Ravenna is 31 km. It takes approximately 30m to drive from Cesenatico to Ravenna. How do I get a train ticket from Cesenatico to Ravenna? 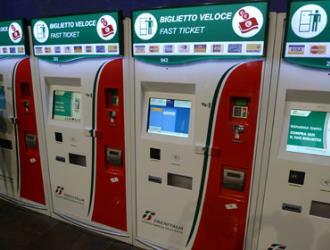 Book your Cesenatico to Ravenna train tickets online with Rome2rio. Discover how to get to attractions and hotels near Ravenna. The Basilica of Sant' Apollinare in Classe is an important monument of Byzantine art near Ravenna, Italy. When the UNESCO inscribed eight Ravenna sites on the World Heritage List, it cited this basilica as "an outstanding example of the early Christian basilica in its purity and simplicity of its design and use of space and in the sumptuous nature of its decoration". The Archiepiscopal Museum (Italian: Museo Arcivescovile) is located in Ravenna, Italy, next to the Baptistry of Neon and behind the Duomo of Ravenna. In the museum relics of early Christian Ravenna are preserved, including fragments of mosaic from the first cathedral church, and the chapel of Sant'Andrea, dating from the Gothic kingdom. Mirabilandia is an Italian amusement park, located in Savio, a frazione of Ravenna, which is located in Emilia-Romagna. With a total area of 850.000 sqm, it is the biggest Park of Italy. Safari Ravenna is a Safari park and Zoo in Ravenna, Emilia-Romagna, Italy, created in 2012 near the Amusement park of Mirabilandia; extending over an area of 340.000 square metres. There is a large area for large mammals and birds to be seen only by car or train, and a smaller traditional zoo with the Reptile section, Primates, Australian section and domestic animals. Rome2rio makes travelling from Cesenatico to Ravenna easy. Rome2rio is a door-to-door travel information and booking engine, helping you get to and from any location in the world. Find all the transport options for your trip from Cesenatico to Ravenna right here. Rome2rio displays up to date schedules, route maps, journey times and estimated fares from relevant transport operators, ensuring you can make an informed decision about which option will suit you best. Rome2rio also offers online bookings for selected operators, making reservations easy and straightforward.